The Dark Decay Assay was not discovered through one moment of inspiration but through stepwise exploration of an idea that had a good chance of succeeding. This chapter shows how. Once a workable method transpired, it was used to explore the environment, leading to more discoveries but also to paradoxes that simply meant that there was still more to discover and to understand. Simplification of the plankton ecosystem. A pH meter leads the way but initial measurements are disappointing. How the DDA was discovered. Hydrogen ions escape. Minimising hydrogen ion losses. Natural pH of the sea. A standardised method could be achieved only by stabilising temperature. By elevating the temperature somewhat, experiments could be shortened considerably, saving both time and effort while also increasing accuracy. A failed linearity experiment showed that completely decomposed samples decomposed further when a small amount of energy food was added. This reminded us of the laws of thermodynamics that complete decomposition is not possible without addition of a high quality fuel. Vial size and type are important as the bacterial activity is easily disrupted. In any test which is intended to povide quantitative data, it is important to know the relationship between the measured and the actual quantity. Ideally such a relationship is linear, meaning that there exists a one-to-one correspondence between the two. We encountered interesting difficulties. For those who visit the sea under water, visibility is an important indicator of water quality because the environment becomes poorer when visibility decreases. Visibility may enable us to estimate the biomass of the producers. The DDA measures decomposer activity, of which the first three days are the most decisive. The rate of attack (RoA) is one of the most important outcomes, correlating well with degradation but results show inexplicable variability. What is the quality of the water around Northland? Do the measurements make sense? Do we need more measurements? Because freshwater lakes are not intensively interconnected like the seas, their DDA curves are quite variable and indeed specific to each lake. Results show that acidic lakes can accommodate higher densities of plankton. If samples can be kept in storage without loss of information, it would be beneficial to the accuracy of the method and it would also be easier to obtain samples from people who do not do the actual measurements. Inside aquariums of no more than one litre, one can grow a plankton ecosystem until long-lived algae begin to grow on their walls, but even then the biomass inside remains what matters. Plankton in eutrophied environments is often growing at maximum densities, leaving excess nutrients unused. These can be measured by diluting the sample and growing plankton or other plant matter. But there are problems.
. For suggestions and comments, please e-mail the author, Floor Anthoni. Read tips for printing. The Dark Decay Assay was not discovered by accident. It followed on from observations of decay underwater and the subsequent discovery of the missing ecofactor, the planktonic decomposers. There had to be a way to measure these and the only instrument capable of measuring such low concentrations had to be an accurate pH meter. It is common knowledge that scientific research on plankton has been rather disappointing, hampered by an ever changing mix of thousands of species and millions of individuals, ranging from viral particles less than 0.2µm to just visible zooplankton of 2mm, a range of over 4 orders of magnitude. The only real progress could be expected from far-reaching simplification of the whole, as shown in this diagram. The three arrows represent the three main groups of life. The producers (green) make long biomolecules with hydrogen bonds, thus scavenging hydrogen ions from the surrounding water: the pH goes up. The food chain (orange) burns these biomolecules with oxygen while also storing for growth: the pH changes little. The planktonic decomposers (brown) break down wastes and dead bodies by breaking the biomolecules and their many hydrogen bonds: the pH goes down. Although this is very much an oversimplification of all the processes taking place, it sums up its essence. The orange side branch represents the respiration from plant plankton in the dark but it has proven negligible. The brown side branch represents death and decomposition of phytoplankton. When eutrophication exceeds unknown limits, it can short-circuit the food chain such that most (if not all) biomolecules (solar energy) end up feeding the decomposers. The simple idea is to measure the pH of the sea and if the pH is high, the producers rule, which is good. If the pH is low, the decomposers rule, which is bad. When measuring the actual pH in the sea around the North Shore peninsula of Auckland, New Zealand, a range is found from 7.62 in a brackish upper-estuary creek to 8.13 at the East Coast beaches. It corresponds roughly with what we would call the quality of the water, from bad to good. Thus by going further out to sea, much higher pH values should be found but they seem to level off at 8.20. Yet there exists an enormous difference between the fauna found at remote islands, compared to that found here at the East Coast beaches. It comes to mind that the differences in salinity may have caused the observed differences in pH, and when these are plotted, a clear relationship emerges. So what are we measuring? What is THE pH of the sea anyway? Surprisingly, a clear relationship is found between turbidity and initial pH. Turbidity or poor visibility has always been a good indicator of water quality, and finding this relationship is encouraging but unfortunately not very useful. When measuring three points in the Manukau Harbour where Auckland's sewage is discharged after treatment, it was clear that initial pH could not be used as a measure of water quality. At French Bay inside the harbour we measured 8.06 while we could see and smell that the water there was very polluted, to the extent that oysters, eelgrass and sea lettuce could no longer live there. At Cornwallis, halfway to the entrance, the water was of much better quality and the shores showing more life as well at a pH of 8.16. But at the entrance the pH slumped back to 8.07 with visibly much better water, allowing even mussels (Perna canaliculus) and stalked kelp (Ecklonia radiata) to grow. In a high tide rock pool we measured a pH of 8.74. It became clear that the pH meter was able to 'see' things we could not see but that it was rather useless to measure water quality with. On the way home, while making a stop for an icecream, the DDA idea was born. It was obvious that in the sea the producers were able to push the pH up while at the same time the decomposers were pulling it down, resulting in all kinds of possibilities. It occurred to me that we should exclude the producers so that the decomposers could be measured. This could easily be done by placing vials in the dark so that the phytoplankton would immediately cease activity and eventually die, but the vials had to be sealed in order to keep all chemicals inside. The resulting effect was large and meaningful as the graph shows. At French Bay the decomposition rate is indeed highest, followed by Cornwallis Beach and then the entrance at Whatipu. The pH of the rock pool also dips to meet the final pH of the inner harbour. The water at the entrance does not decay as much as that of the inner harbour and final pH could well be a proxy for the total biodensity in the water. To test whether decomposition had completed, we exposed the vials to light again with varying results. After a small immediate recovery, pH remained either constant or decomposition set in again. So what were we really measuring? To prove that the effect was caused by life, a slight quantity of formalin (formol, a 35-40% solution of formaldehyde CH3.COH) was added. Even one drop (~0.07ml) of formaldehyde (40%) was sufficient to halt decomposition. Sample A was taken from a reasonably healthy harbour, whereas sample B originated from the backwaters where salinity was also much lower. The formol curves slowly creep towards pH=8.1, the natural pH of seawater, as bacterial activity has been halted. From two decades of careful observation, we knew that the area around Cape Brett had the clearest coastal water found around Northland, New Zealand. Samples taken here showed a great deal of variation with varying rates of decomposition. While travelling over patch R, we noticed that the smell of the seawater had changed, and stopped to take a sample. It turned out to be rather unusual but more in line with what we had expected of all previous samples. First the living plankton must die before rapid decomposition can take place. However, in all previous (and future) samples we found high chronic decay right from the first measurement. In sample R there was hardly any measurable decay for over one day, one night and another day, followed by unusually rapid decay. We were sure that this was not an artifact, as all other samples, taken on the same day, and going through exactly the same procedure, do not show anything like it. Samples S and T confirm how this patch of powerplankton dilutes with surrounding water. What we were witnessing was some form of suicide (lysis), perhaps nature's way of keeping the precious nutrients in the photic (sun-lit) zone. But this mechanism would also make this kind of plankton eminently digestible. It apparently also keeps the decomposers at a very low level, thereby lowering their risk of infection. It is a form of super-healthy plankton. We named this plankton assemblage powerplankton because of its ability to transfer the solar energy straight into the food chain without measurable losses: there is no measurable chronic decomposition (no left-overs for the bacteria). We now posit (propose, assume) that the powerplankton was once abundantly available, powering the once bountiful coastal fisheries. Its loss has led to weak fish stocks that are easily overfished. But the powerplankton discovery may go one step further, explaining why fisheries worldwide have entered a critical phase, even where managed extensively. Fishermen report that fish are dying from starvation in seas green with chlorophyll. It is a paradox that may now have been solved. Of course further confirmation is necessary. In order to study the rate of loss of hydrogen ions, vials from two batches were opened. Within hours their pH jumped up, equal to a rapid loss of hydrogen ions, most likely caused by escaping decomposition gases like carbondioxide CO2, hydrogen sulphide H2S, dimethyl sulphide (DMS), methane CH4 and others. In the end, all samples converged on the same pH, which we named natural pH or the intrinsic pH of the sea. Such rapid loss of hydrogen ions was a little unexpected and made us aware that the DDA method needed to be improved in order to minimise losses caused by opening the vials for measuring. In the beginning we observed how initial pH and salinity were somehow related, and we wondered how much this was supported by measuring the natural pH of the sea by first decomposing a sample fully and the ventilating it to equilibrate with the air. It is an experiment taking two weeks for full decomposition, followed by a full week of ventilation. In the meantime some water has evaporated, which needs to be replenished with distilled water, which in turn upsets pH somewhat. Two experiments were done showing very little difference from pH=8.1 over a range of realistic salinities. Note that natural fresh water has a large range of natural salinities, depending on the geology of their catchment areas and volcanic vents. For more accuracy a larger number of experiments is needed. A number of experiments were done to investigate the best ways to minimise hydrogen ion losses. The size of the gas bubble above the sample proved to be of critical importance. During the experiment, but particularly towards the end, gases equilibrate into the bubble such that their partial pressures are equal to those in the liquid. At the moment the sample is opened, these gases escape and upon completion of the measurement, the new air bubble is slowly charged again with escaping gases. minimising the air bubble: the Fuji film containers are particularly well suited because of the shape of their lids. The problem is that the air bubble must be large enough to allow insertion of the pH probe without spilling liquid. So it can't be nil. The collar lid made from a normal lid, allows the liquid to spill out without being wasted. minimising the number of measurements: the number of measurements was brought back to 7 with an additional check after one week. In the beginning the sample is checked frequently with little risk of hydrogen ion loss because partial pressures are still low. The number of measurements after day 3 is minimised to only two, followed by a final check. Experiments showed that decomposition was erratic and incomplete within vials that were opened only once at the end. Apparently some gas exchange and cross-contamination was necessary to attain useful results. We have not been able to ascertain what was the precise cause of this, but the later discovery of alcohol enhancement may provide the answer (see further below). For the actual time schedule, see manual/time schedule. Note that it is based on temperature enhancement and stabilisation. Because the DDA tests depend entirely on microbial activity, it is also very sensitive to temperature and fluctuations thereof. An affordable portable incubator which could be powered from both 12 Volt DC and AC mains power was not available, so we decided to construct our own by modifying a commercially available Peltier-effect car fridge. A Peltier element produces heat on one side and cold on the other side when a current is passed through it. One side of the element is connected to the inside of a thermo-insulated box and the other side to a heat exchanger air-cooled by a fan. By reversing the current, the inside cools rather than warms, as the outside warms rather than cools. A disadvantage of a Peltier element is that it is not very efficient, requiring high power for low cooling capacity. Its main advantage comes from its simplicity and low cost. A higher temperature also accelerates the experiment, which saves time and effort. However, it also potentially introduces unwanted effects, such as perhaps killing phytoplankton prematurely, or simply by being different from what happens in the sea. A higher temperature may reduce the escape of hydrogen ions, as the microbial processes are very temperature-sensitive (about 100% per six degrees) whereas the physical factors such as diffusion are proportional to absolute temperature (about 2% per 6 degrees). This graph shows two temperature experiments conducted simultaneously at constant temperatures of 21ºC and 27ºC. The six degree difference suggests that one should find the cold sample lagging behind by about a factor of two. In reality the outcome depends also on what is in the sample and it also shows that accuracy deteriorates when the duration of the experiment is extended. Note also that alcohol enhancement after day 5 delivers inconsistent results. A failed linearity test with agar added to expired water gave the paradoxical results shown in this diagram. The quantities of the test solution, a diluted agar, were chosen such that in a log-log graph a straight line should result (1,2,4,..,256 drops). But what we really measured was a renewed decomposition initiated by agar as energy food. Although the highest concentrations of agar gave fastest response, even a single droplet was sufficient to achieve the same a few days later. What was going on here? We then realised that the first and second laws of thermodynamics demand that the energy locked up in biomolecules is insufficient for their complete breakdown. Thermodynamic conversion losses and energy losses due to living, cause an energy deficit that halts the process. When a fuel is added to supplement this deficit (which is only small), decomposition proceeds and (hopefully) comes to an end. 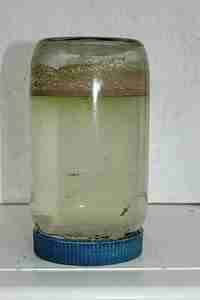 The problem with diluted fuels like agar and sugar is that they eventually rot or ferment inside the bottle. They are also difficult to calibrate and administer. We therefore resorted to ethyl alcohol, the most basic of all fuels. A poison to higher organisms, it can effectively be converted by bacteria and its effect is direct and drastic. From a 90% pure solution a 20% solution was made by adding 3.5 parts of double-distilled water. 1. Energy can neither be created nor destroyed. Thus all forms of energy ultimately convert to heat. 2. All physical processes lead to a decrease in the availability of the energy involved. This defines that all energy conversions such as photosynthesis and decay are accompanied by intrinsic losses. Some of these losses are due to the energy being used by organisms for the sake of living. Other losses occur from the thermodynamic conversions of one energy (a hydrogen bond, e.g.) to another. The ecological consequences of this discovery are rather fundamental and important and require further study. In our thinking about closed nutrient loops within ecosystems, we must now also account for the energy deficit in the decomposition paths. Somehow from somewhere an additional energy must be provided at a stage that it is needed and not just consumed. With these thoughts in mind, we decided to add alcohol in an advanced state of decomposition but long before exhaustion was reached, on day 5 of the experiment. Several experiments were conducted to compare the old method with the new. Once the profound effect of alcohol enhancement was discovered, we asked ourselves whether old experiments could be corrected to fall in line with the new ones. Was the energy deficit threshold a fixed percentage and was it consistent? In the scatter diagram a number of typical types of water were plotted, but not all because many were almost duplicates. It turned out that the West Coast water (90-100%) did not need much alcohol enhancement, whereas east coast water does (20-40%), particularly that associated with clear water (10-25%). The Seafriends aquariums showed erratic results because its water quality was changing (prograding) rapidly (See aquarium studies). Paradoxically, the East Coast water shows much larger biodensities than the West Coast water, which can not yet be explained. From the freshwater lakes we discovered that a large proportion of biomass is occupied by decomposers when lakes are eutrophied. Because these lakes are also more acidic, making hydrogen ions easier to scavenge, their phytoplankton productivity is correspondingly higher. But the sea with its high and rather constant natural pH of 8.10 paints a different picture. From the day/night rhythm produced by freshwater lakes, we see that a pH of 8.1 is a rather limiting ceiling. From this we suggest that in the sea the scarcity of hydrogen ions forms a serious limiting factor. The above scatter diagram shows that the clear water of the outer shelf leaves up to 90% of its biomatter undecomposed. In these areas the pH is also higher. So there is a large amount of undecomposed biomatter complete with unavailable nutrients, for which we coined the new word slush (as in half molten snow). So the sea does not only have phytoplankton (the old way of thinking) but also a great deal of decomposers (the new way of thinking) and now also slush. Decomposers cannot decompose this slush because an additional fuel is not available. The slush hypothesis suggests that this is nature's way of preserving nutrients (they may float up due to long fatty molecules) but plants able to provide a high energy fuel can reach these nutrients with the help of (friendly) decomposers in their surface slime. As the slush is decomposed, the plant gets primarily hydrogen ions it craves for, and as a bonus nutrients as well. Thus this mechanism enables marine plants to grow much faster within a hydrogen ion starved environment. And as the pH increases in the clearer waters, so does the amount of slush! It is remarkable that the West Coast water near Auckland behaves quite different, suggesting that it incorporates little slush as it decomposes nearly fully and rather quickly as well. This can not yet be explained. Reader, please note that the slush hypothesis is very speculative but if one does not think outside the square, one misses the most important things to be discovered. A glass vial of 220ml was part of the test (grey), and it too gave poor results. Why the larger PVC and glass vials were unsatisfactory, cannot be explained. Fortunately the much smaller vial works and this saves space in incubators. We also tested the amount of alcohol required by two separate experiments (thin green curves and green dotted curves) for 1, 2, 4 and 8 drops per 30ml vial. The amount of alcohol had no significant influence over the results even though the sea water used had a biodensity of over 500 hion because of local sewage spills. In any test which is intended to povide quantitative data, it is important to know the relationship between the measured and the actual quantity. Ideally such a relationship should be linear, meaning that there exists a one-to-one correspondence between measured and actual quantity. Our preliminary explorations of freshwater lakes gave good evidence of stunning precision and linearity over four orders of magnitude, but a clean experiment would settle any doubt. The test is really very simple: just add known quantities to pure solutions and measure the results. However, a plethora of difficulties has to be overcome. How does one obtain pure sea water without organic matter (virgin natural water)? All sea samples and all sea salts are contaminated with organic matter. We even had difficulties obtaining pure fresh water. Even a biomedical supply company sold us purified water as distilled water, even though this purified water had very high concentrations of minerals and organic matter! It wasn't even suitable for topping up batteries! Eventually we purchased our own distiller and produced our own double-distilled water but this introduced other problems. For salt water we resorted to expired water of which all organic matter has been decomposed, but this had its own problems and led to the discovery of alcohol enhancement as explained above. We obtained pure sea water from the island state of Niue where we measured the underwater visibility at 60m, but surprisingly, even this clear water contained high biodensity. Divers know that the visibility of water is strongly correlated with water quality, as the environment becomes poorer (degrades) when visibility decreases, even when sediment deposition by mud does not play a role. This is really a contradiction because increased densities of phytoplankton should be beneficial for the food chain, resulting in better opportunities for life. The Plankton Balance hypothesis and the Dark Decay Assay now provide the answer to this paradox. Degradation of the underwater environment is mainly caused by the presence of decomposers which increase their numbers suddenly as plankton becomes denser. To get a grip on these issues, we measured visibility whenever possible and plotted it against biomass in a log-log scale. The conceptual diagram shown here gives an idea what is to be expected. Plankton responds to two main environmental factors: availability of nutrients and availability of light. Where nutrients are in short supply, the water clears and plankton biomass follows an inverse relationship: double the biomass and visibility will halve. Towards very murky waters, soiled by mud, plankton biomass follows a light-limited relationship: halve the visibility and half the biomass can be maintained by sunlight. The data points should thus fall inside the green boomerang which has a maximum somewhere in the middle. Where the two lines cross cannot theoretically be predicted and must be established from many sets of actual data. However, in natural waters, the water quality is constantly changing due to sudden rainfall and consequent ingress of sediments. such temporary reduction in visibility, which may include suspended bubbles from waves, pull the data points to the left but not down as there is no organic matter in either mud or bubbles. There is also an unwanted influence from raw sewage or other organic matter which pulls the data points down and to the left because they are visible. Note that bacteria remain entirely invisible, thus pulling data points down. Note that excess (unused) nutrients cannot be measured by the DDA unless the sample is diluted with pure (virgin) water and left to grow in sunlight for a while (see further below). The diagram (which may need another one since alcohol enhancement) shows how the theoretical expectations are by-and-large met by the actual data. The idea is that the biodensity of phytoplankton lies on the green lines. What is found to the left of it represents light obstruction without biomass and what is below it, the biodensity other than that from producers. If this is true, the decomposers can increase suddenly at about 9m viz, but this does not happen predictably. The grey cloud we named the graveyard, as it is associated with (non-living) biomass accumulating at the surface without being visible. The graveyard was found only in areas with relatively deep clear water, in late autumn. The dots' colours correspond to the areas shown on the map, which allows one to see how they are grouped. Note how the biodensity, calculated from initial and ending pH, is plotted upside-down on a logarithmic scale which is very similar to the pH scale. A new unit is proposed, the hion which is the biodensity corresponding to the number of hydrogen ions in a pH of 9.00. One day the hion will be accurately linked to biodensity in micrograms per litre of dry organic matter or carbon. However, when using the DDA it is not important to know this. Work is continuing on this interesting aspect of the DDA, particularly now that complete decomposition can be achieved by alcohol enhancement. Please note that meaningful values for visibility can be obtained only rarely, during prolonged calm dry weather, low wave energy and neap tides, while taken from a boat, at least several hundred metres from the shore. Meaningful visibility in estuaries can be measured only after prolonged dry weather during neap tides. The RoA is calculated by subtracting the initial pH from the pH after 48 hours the way biodensity is calculated in hions. Please note that the RoA cannot represent an absolute value since it measures the decay of a particular assemblage of decomposers on a specific assemblage of phytoplankton. Very aggressive decomposers attacking very robust phytoplankters may show as a relatively low RoA. The RoA thus measures producers versus decomposers rather than environment versus decomposers, which is what we would really like to know. As we knew how important water visibility is to the quality of the environment, we were interested whether this also showed in the measured rates of attack. This graph plots both in a log-log relationship, visibility horizontally and RoA in hion vertically. For comparison the linear relationship is drawn as the green dash-dotted line. The colours correspond to the areas shown on the map. Note how the various plankton assemblages neatly group together although with large differences between them. One can say that the rate of attack increases as visibility decreases and that this is much less so in clear water where the curves flatten out. Also a sudden increase is seen between 5 and 10m viz. Note that these measurements were done before alcohol enhancement but that this should not affect these results. We found a very similar relationship for freshwater lakes. The curves consistently show a sudden increase between 5 and 15 hion RoA indicating that this is when degradation sets in. Healthy water tends to have RoAs less than 10 hion. We expected the rate of attack to be related to decomposer biomass and thus to total biodensity. The idea is simple: the more bacteria, the steeper their attack. The graph shows horizontally the relative rate of attack as a percentage of biodensity and vertically log biodensity. The colours correspond to the assemblages in the previous graph. The only certainty obtained from this relationship is that low relative RoA is rare and high relative RoA happens at the West Coast and that most relative RoA is between 10% and 20% of biodensity. With some imagination one can even say that relative RoA declines as biodensity increases. Note that these results may ned to be reinterpreted with the introduction of alcohol enhancement because that affects total biodensity and this scatter diagram will be upgraded in due time. By mapping the results, we could obtain an overview of what the DDA says about water quality in an area we know well from frequent diving. The map shows the results of measurements done mainly between March and May, late summer to autumn when water quality is at its best. But remember that it is but a snapshot in time and does not reflect average conditions. Much more sampling needs to be done throughout the seasons. Even so, results look promising as they also correlate to degradation observed under water. For a complete report visit map01.htm. By showing both RoA (in red) and biodensity (in green), one can get an idea of the situation. None of the sites shows powerplankton. Healthy plankton has RoA= 5 to 10 over biodensities of 30-60. Sick plankton has RoA between 10 and 30 and killer plankton RoA over 30. (see above) Maximum biomass is less than 100 hion and where it exceeds this, raw sewage must be suspected. Using these criteria, one can see that the seas around Northland are rather sick, sufficiently degraded to affect fisheries. The West Coast suffers from the runoff from a large area to the south of this map, which flows through the Waikato River into the sea where 100/238 is marked. Also the (treated) sewage from one million inhabitants flows into the sea from the Manukau Harbour where 69/160 and 54/154 have been marked. These are extremely high RoAs and biodensities that make life impossible for a vast range of species. In the Far North also very high biodensities are found, which cannot be explained from local runoff and we suspect that West Coast water flows northward, around North Cape and then back southward along the east coast. This also needs further investigation. Please note that the biodensities shown here may need to be reinterpreted because of the improved technique of alcohol enhancement. However, the charted rates of attack (red) remain valid. Further mapping is needed and also further out to sea and all around New Zealand. Because freshwater lakes are not intimately interconnected like seas, their DDA curves show high variability, and are indeed specific to each lake. The minerals and acids of a lake depend largely on the geology and land use of its surrounding catchment area and also on the presence of volcanic vents. Freshwater lacks the salt of the sea that makes sea water much less solvent. As a consequence, fresh water can store higher concentrations of nutrients and minerals and produce much higher plankton biodensity than seawater. All this shows clearly in DDA tests. stability: unlike the plankton in the sea, that of lakes cannot drift away with ocean currents. It is therefore more stable and can be studied where it stays, from season to season. separation and variation: many lakes are entirely separated from one another as water does not flow uphill. Thus depending on their catchment areas, a larger range of extremes can be expected than in the sea. This allows for discovering rules and natural laws that apply across their variety. It also tests the DDA technique over a wide range of situations. simplicity: freshwater ecosystems are inherently simpler than marine ecosystems. They have fewer species and species assemblages. accessibility: lakes can be accessed more easily than the sea and in a single weekend samples can be gathered from a large number of different sites. small waves: due to their short wind fetch, lakes do not have waves large enough to stir sediment over large areas. Visibility is thus more related to phytoplankton density. In this single graph 24 New Zealand lakes have been brought together. It shows that the DDA has a proven range from pH= 5.5 to 9.5, over four orders of magnitude, which is quite outstanding for a measuring device. The curves can be compared with one another because all have been incubated at a constant elevated temperature of 27ºC but alcohol enhancement had not been invented yet. At the conclusion of each curve, the vials were opened (while still in darkness) to ventilate in order to establish the natural pH of each lake. For some curves this has been drawn as the upward segment ending in a large dot. The DDA curves are full of surprises and paradoxes, some of which touched upon here. Most lakes show very high rates of attack and high biodensities. Only in Lake Tarawera and Taharoa (a dune lake in the north) is the powerplankton found. Fishermen say that the trout there are fat and healthy, unlike those in the other lakes. Lakes Rotorua and Rotoehu show a rise in pH before decomposition sets in, perhaps because they are so shallow that the bottom (benthic) decomposers dominate. When the rate of attack (over 48 hours, green) is plotted versus biodensity, an almost straight line results (green), implying that bacterial attack rate in 48 hours is a constant part (27% at 27ºC) of the measured biodensity but much less for low biodensities. (Note that the black dash-dot line gives precise linearity) This is the relationship we expected to find for saltwater, but it has eluded us so far because marine plankton ecosystems are more complex. The straight-line relationship suggests a kind of normality for lakes, that bacterial activity (and thus their biomass) is a fixed part of biodensity. Some lakes deviate from the 'rule'. Pupuke, Rotoma (roadside) and Quarry have lower than expected bacterial activity, whereas the rather clear dune lake Taharoa has a higher one. We also plotted the 24 hour rate of attack (RoA24, red) because this is more representative in fresh water where decomposition proceeds rapidly. For high biodensities, the curve follows the straight linearity, implying that RoA24 is also a fixed part (10% at 27ºC) of total biodensity. However, for low values of biodensity, the RoA decreases rapidly, signifying plankton health. In this area a doubling of biodensity results in a five-fold increase in bacterial attack. It suggests that truly healthy lakes have biodensities very similar to the sea, less than 150 hion with much reduced bacterial activity and RoA48 less than 10 hion. One of the amazing results of the lakes expedition is the discovery that the maximum biodensity a lake can carry when it is fully eutrophied, is a function of its natural pH. The lower this pH (the more acidic the lake), the higher biodensity the lake can carry. It appears that the availability of hydrogen ions is what matters to the maximum density of life in water. In the graph we have named the lakes that deviate from the eutrophication line as these are perhaps not fully eutrophied. The crystal clear water of Hamurana Springs (30m viz) is of course exemplary but its cultured aquarium falls inside the line. All named lakes are known to be of high quality and even Rotoiti on both sides falls just left of the line. Note that lakes Tarawera and Pupuke who stand out by their low rates of attack, are still in a precarious state on the eutrophication line. Note also that the sea (East Coast natural pH=8.12; Westcoast = 8.03) falls neatly in place on this graph with Murrays Bay dipping far below the line because of a massive ingress of raw sewage. The ultra-clear water of Niue plots very high above the line. maximum biodensity = ALOG( 1.55 - natural pH ) hion, where the factor 1.55 needs further confirmation. The idea behind this graph is that lakes cannot overstep their maximum biodensity as given by the eutrophication line and the above formula. Any nutrients in excess cannot be used (but we have not measured these). It is worrisome that even our clearest lakes are close to being fully eutrophied and the situation in the sea is worse still in many places. By plotting biodensity versus visibility, it was hoped to find a relationship. One would think that in still lakes the amount of phytoplankton can be derived from measured visibility, and that the data points would be located along two conceptual lines (reciprocal relationships like y=x and y=1/x), one for nutrient-limitation and the other for light limitation. That Waahi, Waikato and Waikare lie most left of the centre is caused by the amount of sediment in these waters. Because the data is coherent in other aspects, one cannot escape the conclusion that most of the biomass in the eutrophied lakes is made up of decomposers. The thin V-curves indicate decomposer levels of 2, 5 and 10 times that of the producers. In order to sustain such high decomposer levels, the producers must be correspondingly more productive. This seeming paradox needs further investigation. By placing the one litre 'aquariums' in light by day and darkness by night at room temperature, we observed spectacular growth and decay in a single day and night, after which the day-night rhythm disappeared. When plotted against natural pH (on right), it reveals that phytoplankton growth indeed follows the relationship discovered before for biodensity. Thus slightly acidic lakes indeed maintain large biodensities of decomposers through their sheer productivity by day. But this situation is not without risk as the experiment shows. In the end the decomposers won and the lake in the 'aquarium' died. It shows that lakes maintaining high levels of decomposers can suddenly die by a combination of external factors such as a run of dark days or a sudden warming. Remarkably, three lakes scavenged hydrogen ions up to the magical ceiling of pH=8.1 which may well be an overall limit. Ironically, the natural pH of the sea is also 8.1 and most samples taken during a day are not far from that level. It suggests that a pH above 8.0 is limiting plant growth. Note that the lakes with high biodensities are the most interesting for studying the day/night rhythm, but they are also the most vulnerable to temperature change, which can destroy their natural ecosystems. So far we have had disappointing results but we plan to continue this study under more controlled conditions of light and temperature. Freshwater planktonic ecosystems are perhaps easier to study because they are rather similar with low numbers of species. Because of this the relationships between biodensity and RoA and the natural pH of freshwater bodies became evident whereas in the sea it eluded us. Even so, the relationship between the clarity of the water and biodensity seems a paradox. Our conclusion would be that in the nutrient-limited part of the graph (right-hand side), the difference between the red datapoints and the green dash-dot line represents decomposer biomass and perhaps a little of unknown dissolved organic material. The observation that bacterial activity (RoA) is proportional to total biodensity, except for those lakes with low biodensity, supports this. Is bacterial behaviour inside our vials different from that in situ? They are obviously more aggressive due to the higher temperature, but would their numbers have increased too? This is unlikely as their food source has not changed, except for the phytoplankton dying after 24-36 hours. From the graph one can see that the biodensity of phytoplankton is a small part of the total as most lakes have 2 to 10 times more decomposer biodensity than producer biodensity. Would it mean that Taharoa, Blue Lake and Rotoma have higher productivity to match this, even though they have very different acidities? When the initial pH is related to the natural pH, expressed in hions (see table in fresh01.htm), one can see that in most lakes the producers can keep up with the decomposers. But lakes Rotorua (-212 to -676) and Rotoehu (-225) cannot. Surprisingly, clear dune lake Taharoa (-305) also fails in this respect. The crystal clear Hamurana Springs water (-320) also fails because it has not seen the sunlight for years. The day/night rhythm experiment reported above indeed indicates that phytoplankton productivity depends on the availability of hydrogen ions and that it can achieve amazing rates of growth during the few hours of daylight to match the decomposers' rates of attack which continues unabated day and night. If samples could be kept for a while without losing their information, it would be easier to obtain them from helpers. One could go out in a boat for one or more days, take samples here and there and these could be measured later. Using this technique, one could place the samples in the incubator all at the same time which would make the calculation of RoA easier too. It would also be beneficial in case a previous experiment had not quite finalised. The graph shown here gives the general idea. Samples were taken from a one litre aquarium on days 0, 1 and 6, but these measurements date from a time before temperature stabilisation and other improvements. The main question is: can a plankton ecosystem be kept, and if so, for how long? What one often forgets is that one of the most important environmental factors affecting plankton is that it knows of no walls. Plankton organisms live all their lives without ever encountering a wall. It means that macro algae and thread algae cannot survive, because they need something to attach to. Once attached, these longer-lived algae take over, changing their environment, like raising the pH as they successfully scavenge hydrogen ions in competition with the short-lived phytoplankton. The graph follows an aquarium for over two weeks, and after one week the pH rises. It can rise to 9.5, we noticed, as the plankton ecosystem gradually changes, behaving more like a rock pool. But biomass cannot escape or enter the jar if the jar is kept sealed. So if biodensity is all that is needed, a sample can be kept in a one litre jar almost indefinitely, when placed in front of a cool window facing away from the sun. After many weeks, one sees the walls becoming green with pasting and threading algae. Before doing the measurement, brush the inside of the jar with a clean dishwashing brush to dislodge all living matter. Shake well before dividing the content over the measuring vials. In order to test how well samples keep in a one litre jar, a sample of eutrophied seawater was taken and over a period of three days two vials were taken from it each day and subjected to the DDA. In the graph these have been lined up on day one, and in order to synchronise at 'day 13', all samples were treated to two drops alcohol on days 11, 12, 13, shown here as a single day 12. The curves show that initial pH first goes down, then up again, but this depends on the amount of sunlight experienced through the window the jar was placed before, at ambient temperature. The results have been summarised in the table below. It suggests that samples can be kept for a few days without seriously affecting the outcomes. So it is possible to have assistants collect water samples during one day, to be tested that same evening or the next day. It is necessary, however, to store the samples in a light, cool place. Note that alcohol at day 12 is not a good strategy as it introduces uncertainty. It is better to administer the alcohol between days 3 and 5. It is hard to believe that a sample taken from a lake or sea, looking very much like a glass of clear drinking water, represents a fully operational ecosystem with thousands of species and millions of individuals. Most of these are sub-microscopic and their collective biomass rules when eutrophication (over-feeding) is neared. One would think that plankton can be grown from a sample of sea water, but this is not entirely true as the composition of life inside a jar changes and short-lived planktonic organisms are replaced by longer-lived sessile ones. In a professional microbiology laboratory one can isolate a monoculture of phytoplankters and cultivate these in a suitable medium under sterile conditions such that decomposers and sessile algae are eliminated, but this does not resemble the plankton ecosystems of the sea. The method of growing plankton and/or micro algae is very useful to determine the potential biodensity from free nutrients. The clear water is contaminated with a few drops of salt or fresh water to introduce species, and left to incubate in daylight in an open container to let carbondioxide in. Evaporated water is eventually replenished by distilled water. After 3-4 weeks all nutrients will have been converted to biomatter and this can be measured using the DDA. In this manner one can measure nutrient concentrations in units meaningful to life (hions). As a matter of interest, we have been successfully growing an entire but simple ecosystem inside a one litre peanut butter jar. It consists of phytoplankton, sessile algae and bacteria. In it swim a dozen or so hardy brine shrimps and many eggs and babies. This ecosystem-in-a-bottle is hermetically sealed and its lid glued in place, such that it cannot be opened accidentally. It has been living in a cool place of the garden, in half sunlight since January 2003. Whenever we teach about ecosystems, the bottle is paraded on top of the overhead slide projector and children have to figure out how my pets live from sunlight and never need to be fed. Ideally, every classroom should have one. Did you know the answer? In a true ecosystem everything is recycled. The brineshrimps need food and they eat the planktonic algae which you can see in the top as a green soup. The food provides them the building blocks for growth and the energy for swimming. But they need oxygen too, which is also provided for by the plants. But the plants need carbon dioxide, which is what the shrimps breathe out. And they need nutrients. These come from the shrimps' wastes which are converted by bacteria to nutrients and carbondioxide. So, all minerals and oxygen are recycled. The only thing needed from the outside is sunlight for the plants to grow. So, in effect, the shrimps live from sunlight (and so do the plants, and the bacteria). The DDA cannot measure free or unused nutrients in heavily eutrophied waters or where fresh water mixes with salt. But a sample can be diluted with virgin water and then left to grow until all nutrients have been used up. Once that has been achieved, the once free and excessive nutrients converted to biomatter, can be measured with the DDA. The idea is simple, but where can one get virgin fresh or salt water with the right amounts of minerals but without nutrients or biomatter? One would be tempted to use distilled water instead, but we found that this seriously alters the initial pH such that comparisons cannot be made. We are looking at using salt water from a place where nutrients and biomatter are indeed very scarce in order to continue these kinds of experiment. It could also teach us more about how degraded fresh water mixes into clear sea water.